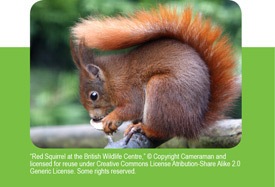 Photographer Scott Bourne offers some useful ideas on taking wildlife pictures. They're a quick read and a handy guide. Check out the list of wildlife parks in Florida and around the country. They offer convenient opportunities to take fabulous pictures of animals. When you're ready to get great prints be sure to visit us and order your enlargements on iPrints.com and/or iPrintsPro.com. We'll bring your animal pictures to life! 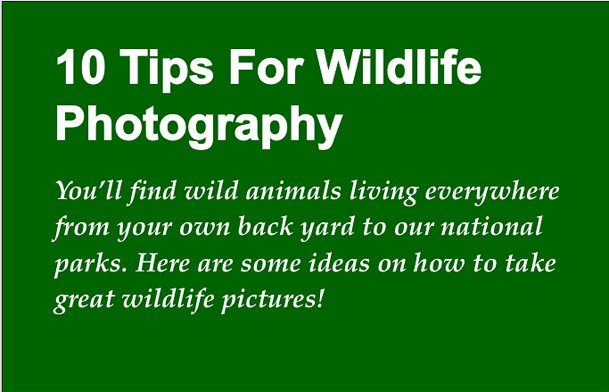 Many of these suggestions can just as easily apply to shooting kids' sports or any action photos as they do for taking pictures of animals in the wild. 1. Be prepared for shooting opportunities close to home. Wherever you live, your chances are good that there are animals nearby to photograph. Be aware of local species. Do research to find out which kinds of animals frequent your area and when they are nearby. Many city parks have animal habitat sanctuaries that offer great photo ops. 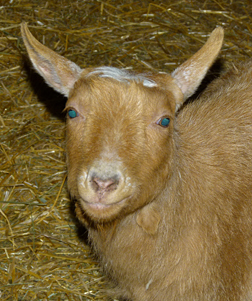 Children's petting farms offer easy close-ups of cooperative animals. Lil' Folks Farm had everything from cuddly barnyard animals to horses and llamas. 2. Have a telephoto lens or a camera with a long zoom capability - Try to carry a 300 to 400mm lens with your camera. You never know when you’ll get a chance to shoot a great wildlife picture...and you won’t capture many of those images without a long lens. Your flash, batteries, and memory cards should be in your pockets. Pawing through your camera bag in the middle of a wildlife encounter will usually result in a lost opportunity. Keep your basics in the same place every time you go out, so you'll immediately know where to find them. Start by finding a good background. An uncluttered background will add to your photograph rather than detract from it. If possible use a background that depicts the animal's native habitat. You'll improve the photo's impact. 5. 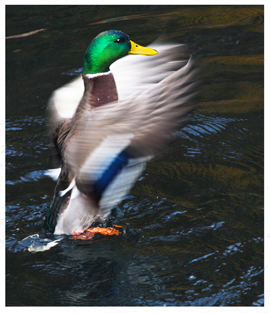 Shutter speed - Shoot with a fast shutter speed when trying to get moving animals in sharp focus. Use your camera's shutter priority mode. The rule of thumb is that your minimum shutter speed should match your lens' focal length. So, if you're using a long lens – like a 300-800mm f/5.6 – set 1/750 of a second as your minimum shutter speed. 6. Tell a story. Look for situations that tell a story, convey a concept or communicate a mood. Keep the light at your back, and point your shadow at the subject unless you have a very good reason to do otherwise. Consider using your flash in daylight. You'll significantly open up shadows, even for distant animals. When photographing groups of animals, look for separation between subjects. Avoid merges. This takes patience, but it’s worth it. 9. Take pictures of animals when they're alert and involved in their daily activities - Sleeping animals are not interesting. Try to capture their intensity while they're active. 10. Stay focused on taking pictures; not reviewing them. When photographing action such as moving animals, staring at your camera's LCD screen will cause you to miss opportunities. Crop your pictures with our easy-to-use software. Choose from Lustre, Glossy, and Metallic professional Kodak papers. Get fully corrected enlargements from skilled photo technicians who really care. Our mission as your pro lab is to make you look good. You snap the pictures ... we'll do the rest! P.S. Do you have a friend who is interested in getting better photographs? Just click Forward Email below to share this information. Our thanks to Scott Bourne at Photofocus.com for his copyrighted tips. Photo credits and our thanks to Dr. Mervyn Hurwitz and his lovely wife, Melanie Hurwitz, who are President and Vice-President of the Coral Springs Camera Club, Coral Springs, FL. 1. Plantation Heritage Park - 1100 S. Fig Tree Lane Plantation, FL - http://www.broward.org/Parks/PlantationHeritagePark/Pages/Default.aspx - This 88.5-acre park was formerly a University of Florida agricultural experimentation farm. Plantation Heritage maintains that horticultural theme with tropical flowering trees and palms throughout the park, along with many displays of landscape plants. The park has a large, fish-stocked central lake that forms the center of a protected bird sanctuary. 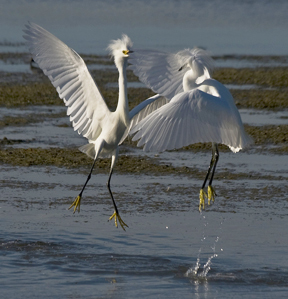 There you will find large flocks of native birds such as ducks, geese, swans and egrets on a year-round basis. Since the birds are accustomed to people, you can walk up to them and take close-up photos. Take your family with you as there are excellent picnic facilities, paddle boats and playgrounds. Admission is a Bargain: Free M - F; $1.50 per person (over 6 yrs.) on weekends. 2. Butterfly World - Located in Tradewinds Park - South 600 W. Sample Road, Coconut Creek, Florida -Tel: 954-977-4400 - http://www.butterflyworld.com - Butterfly World is the largest enclosed butterfly sanctuary on Earth. You can literally walk among thousands of the most beautiful butterflies you can imagine. They also have an excellent collection of hummingbirds. All this is housed within a magnificent setting of tropical foliage. You'll get better butterfly pictures here than if you trekked through a tropical rain forest. It is a great day trip...and an excellent family outing that will be enjoyed by children of all ages. Admission (worth the price): $24.95 Adults; $19.95 Children. Annual Passes; $40 Adults; $30 Children. Discount Offers: Check on the Butterfly World web site. 3. Flamingo Gardens - 3750 South Flamingo Road, Davie, Florida - Tel: 954-473-2955 - http://www.flamingogardens.org/ - Flamingo Gardens is a not-for-profit wildlife sanctuary, aviary, and botanical garden set just west of Fort Lauderdale. Animals include otters, alligators, bobcats, Florida Panthers, tortoises, fresh water turtles, geese, swans, Sandhill Cranes, Blue-beaked Ducks, flamingos, Bald Eagles, Golden Eagles, owls, peacocks and macaws. The 25,000 square feet (2,300 m2) Everglades aviary houses one of the largest collection of wading birds in the United States. Species include, White Pelicans, Roseate Spoonbills, White Ibis, Wood Storks, Brown Pelicans, Great Blue Herons, Great Egrets, Snowy Egrets, Anhingas, Double-crested Cormorants, Tri-colored Herons, Night Herons and seagulls. The aviary exhibits five native Florida ecosystems; coastal prairie, mangrove swamp, cypress forest, sub-tropical hardwood hammock, and sawgrass prairie. The grounds contain more than 3,000 species of tropical and subtropical plants, including orchids, ferns, bromeliads, 200-year-old oaks, and 300 plus species of palms. A narrated tram ride leads through the site's tropical rain forest, native hammock, wetland areas and groves. Admission (worth the price): $17 Adults; $8.50 Children. Want to get up close...but not-too-personal... pictures of alligators? You can't beat the Everglades! Everglades National park is the third largest national park in the lower 48 states. It is a vast expanse of roughly 1.5 million acres. Visitor centers of the park are open every day year round and have park rangers available to help you plan your visit. Beyond photography there are all sorts of outdoor adventures from hiking to air boat rides through the "River of Grass." Admission: $10 per vehicle for up to seven consecutive days. 1. Bosque del Apache, N.M. – www.fws.gov/refuges/profiles/index.cfm?id=22520 – Bosque del Apache (woods of the Apache) is a 57,191-acre national wildlife refuge 18 miles south of Socorro, New Mexico. 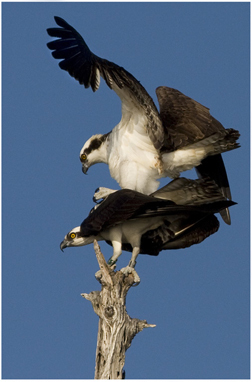 More than 300 species of birds migrate to the Bosque each year. It is a great place for Blue Herons; mallards; Snowy Egrets; Sandhill Cranes; roadrunners; Ross’s, Canadian, and Snow Geese; Bald Eagles; Cooper’s and Red-tailed Hawks; and wild turkeys. Surely no place in the western United States can boast such a concentration of birds and wildlife. The migrating geese and cranes start to arrive in earnest at the refuge in November. Any visit between mid-November and early January should yield a refuge filled with tens of thousands of birds. 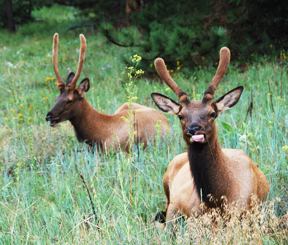 Visit www.friendsofthebosque.org for more information. Note: This is probably the last year Bosque will be on my list. The refuge management and police are not easy to deal with. They don’t like photographers and will use pretty much any excuse they can to harass them. Be careful and avoid them if possible. 2. Northwest Trek Wildlife Park, Eatonville, Wash. – www.nwtrek.org – This is a great place to photograph deer, elk, moose, bear, and various other animals and birds native to the northwest. There are several options here. (1) Enter the park and ride the tram around the free roaming area. There aren’t many photographic opportunities from the tram, but it does give a good idea of the lay of the land. (2) Arrange to take a special photography tram. These are offered every quarter. In either event, also walk around the staged exhibits; this is where the best shots are. Even though some people would refer to these as cages, they are really natural enclosures designed to mimic the animals’ natural habitats. Some favorites here are porcupines, Snowy Oowls, raccoons, deer, and elk. 3. St. Augustine Alligator Farm Zoological Park, St Augustine, Fla. – www.alligatorfarm.com – is an amazing place, offering bird (and alligator) photographers a chance to photograph birds in breeding plumage from as close as 4 feet. In late spring and early summer, baby chicks can be photographed at an arm’s length. The birds nest here because of the alligators. By the way, the Alligator Farm boasts every type of alligator and crocodile found in the world. The place is extremely photographer-friendly and a yearly pass ($69.95) entitles the user to early entry. 4. Arizona-Sonora Desert Museum – www.desertmuseum.org – This is a great place to photograph all sorts of raptors, lizards, and other dessert wildlife. It’s close to Tucson, and there are many other bird photo opportunities in the same general area. Also, don’t miss the nearby Saguaro National Park. 5. Yellowstone National Park – www.nps.gov/yell – Yellowstone (particularly in the fall) is an amazing place to find and photograph bison, grizzly and black bear, wolf, coyote, and fox. Access is simple. Backgrounds are beautiful and wildlife is abundant. Just pay attention to the rangers when they tell you to move on. They have little sense of humor. Avoid in the summer – too crowded. 6. Baxter State Park Maine – www.baxterstateparkauthority.com – If you want to photograph moose, this is the place. Just be careful. Moose kill more humans in North America than bears and wolves combined. Go in the fall to catch the rut, combined with great colors. 7. Denali National Park – www.nps.gov/dena – Go in autumn. There are caribou, moose, and grizzly and black bears. Visitors might see the wolf pack, beaver, and the Alaska state bird, the Willow Ptarmigan. Note: Cars cannot be driven all the way into the park. Visitors must take a bus to the interior or rent a night in one of the two or three privately owned hotels operating in the park – all of which are expensive. This list is just a starting point. There are many places around the United States and the world where a wide variety of birds and animals can be found and photographed. These are just some of our favorites. Hopefully, you will enjoy them, too. For more information and inspiration on photography, check out www.cliqworld.com.